Homeschool Moms are a different breed of Mom. It seems non-homeschool parents view us as either crazy or hiding our capes beneath our rumpled t-shirts. There aren't any capes and we don't think that we have all of the right answers. Here are some things that only a homeschool parent can understand. 1. What you hated studying in high school and college will come back to haunt you. 2. No matter how much effort you put into teaching, only your child's effort can make it a success story. 4. The amount of drama from other kids is inversely proportional to the amount of drama between siblings. 5. The "phone a friend" option for information needs to be utilized from time to time. 6. You are free to take a day off, but you will have to make up for it the following week. There are no substitutes available. 7. Organization is the life blood of your homeschool. 8. Stamina is crucial for everyone involved. 9. Your home is not as clean as it once was. 10. You have fantasies about using the bathroom alone. 11. People outside the home spot you as "home-schooled" like a rare wild animal sighting. 12. Your kids impress you with their spongelike brains. 13. The ability to talk to your distant friends has diminished to a texted wave emoticon. 14. Extra-curricular activities are the greatest thing EVER! 15. You work 2 full time jobs with zero paycheck. 16. The desire to read something that you choose is overwhelming. 17. By 5pm, you hate the sound of your own voice. 18. You get excited to do experiments so that you can see the wonder on your kids' faces. 19. You don't throw away 9 pounds of paper from a backpack daily. 20. Fund raisers are limited to each child's extra curricular choices. 21. Days away from the home are glorious! 22. The use of a bra is no longer necessary for most daytime activities. 23. Your kids are learning to do more around the house. 24. You laugh at the old burden of being a room parent. 25. There are moments that you feel like the luckiest parent in the world. 26. To a child, the world is enormous. 27. You continue to wonder how much time is wasted in public schools. I am an honest person. If I told you all that homeschooling was the greatest thing to ever happen to me, I would be lying. We homeschool moms are lambs for the slaughter because the unsatisfactory state of our educational system moves us to do it better ourselves. The most positive part of giving yourself to your kids is that you get to spend so much time with them. It's just a short few years until they're out on their own (cringe). Though it would be great for these turkeys to be in the classrooms we have loved in the past, they are home bonding and absolutely learning. 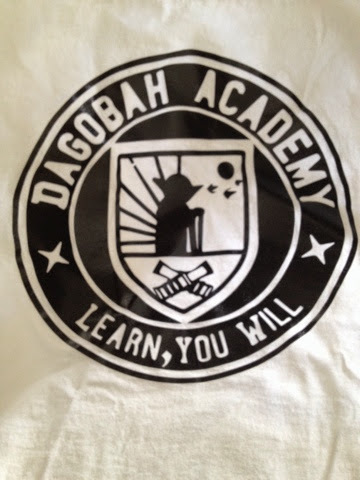 Coming closer together as a family will be the best gift that we will enjoy at Dagobah Academy, along with the hope that there will be a bright academic future for the students.